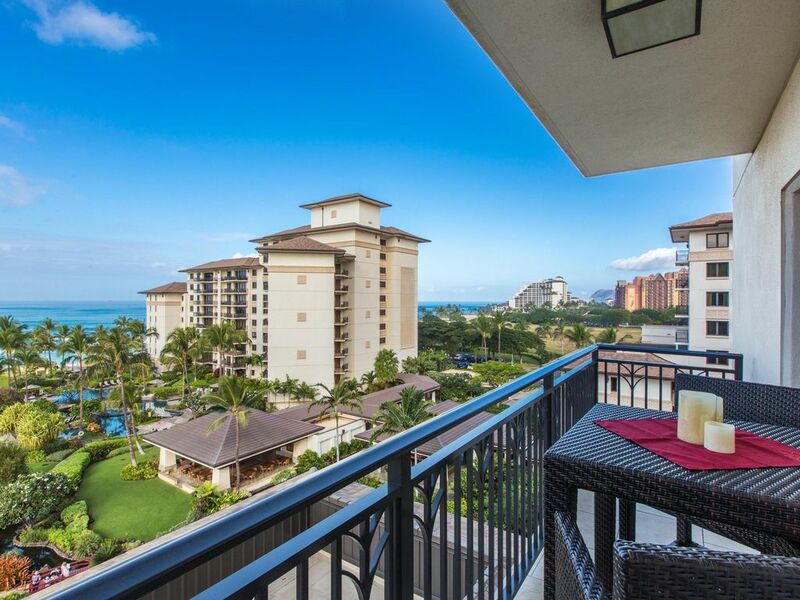 Ko Olina Beach Front Villa - Contact for Our Rates! Experience world-class resort living at this luxury, ocean-front property with all the amenities of a 5-Star Resort. The Beach Villas is located at the Ko Olina Resort & Marina offering everything from championship golf to lavish spa treatments to exquisite fine dining. Some of the amenities include a lap pool, a lagoon pool and a Keiki pool for little ones, all of which have been designed with luxury and relaxation in mind. This high floor custom designed villa offers breath-taking ocean views. There are two bedroom suites with two twin/king-sized beds and a sofa-bed. The beautiful Lanai with pocket doors open up to views of the beach and sunsets. The custom kitchen designed by Hawaii’s famed master chef, Roy Yamaguchi, features the finest appliances and an open design perfect for your enjoyment. There are also two outdoor grills located in the pool area for your cooking pleasure. The unit also includes three flat-screen TVs and washer & dryer. Portable baby crib, GPS, beach toys, beach towels, and beach chairs. Excellent place ! great location! This was a very nice place to stay - we really enjoyed the fact that this property was a bit smaller and quieter than the adjacent resorts, and that it had its own (less crowded) lagoon, which was great for swimming! The condo was stocked with beach supplies, and the owner was very responsive at all times and made booking the place very easy. Would recommend this unit to friends! Thanks so much for everything, Khoi! Our family of 5 (including 3 kids) had a wonderful stay over February break. Check-in with Lynn was easy and pleasant, and she helped us get situated in the parking spot and get our things up to the condo. The entire property is lovely and well-maintained, with beautiful gardens and outdoor spaces. My kids greatly enjoyed getting to help feed the fish in the koi pond every day at 4 pm (when we were around). We also signed up for a lei-making class through the resort, which both of my girls enjoyed. Everyone who worked there was friendly and helpful. The condo itself was attractive and clean, with comfortable space for all of us (with one kid on the futon). We loved the balcony and particularly enjoyed eating breakfast out there - we took advantage of the kitchen and bought groceries the first day at Target, which is about 10 minutes away by car. [Note that Target charges $1/bag if you haven't brought your own - Target bags were the hot accessory in Ko'Olina, as everyone seemed to have one.] The kitchen was fully equipped, including with sharp knives, cutting boards, and clean dish towels. The appliances were high-end and worked well (kids = dishes and laundry). The sunset views from the balcony are amazing. We used both pools a lot, as well as the uncrowded beach and lagoon. The condo has a great collection of noodles, masks, flippers, floaties and boogie boards for use at the beach. We took advantage of the paved sidewalk along the lagoons to walk and get to the small shopping area across from Aulani - we ate Hawaiian BBQ, Monkeypod Kitchen, Island Vintage Coffee, and Pizza Corner, as well as picking up some supplies at the Island Country Market. We did rent a car because there is so much to do on Oahu, and were glad we did, but it was nice to have some things close and convenient for days when we weren't out exploring. The beach bar at the Villas was great for a quick hot dog for the kids but did not have an extensive food menu. Nearby Kapolei had good restaurants - we had great Thai, Vietnamese, deli sandwiches and pancakes. Aulani (the Disney resort) is next door, and we walked over to the lu'au there, which was fun, and it also made us appreciate how much quieter, more spacious and more relaxed it is at the Villas. Overall, we had a great stay and were very happy with the accommodations. It was hard to leave and return to winter snow! This was our second time staying at the beach front villas and this condo was awesome, the view was breathtaking! Loved this side of the tower there was shade on the lanai all the time, everything was clean and perfect...there was beach chairs and toys and a cooler..would stay again...and Khoi was great to work with !